CHERUB: The Recruit tells James Adams' story from the day his mother dies. Read about his transformation from a couch potato into a skilled CHERUB agent. Robert Kilgore Muchamore (born 26 December 1972) is an English author, most notable for writing the CHERUB and Henderson's Boys series. 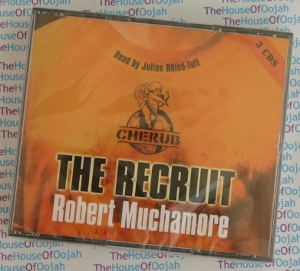 Robert Muchamore started writing the CHERUB books because his nephew couldn't find any books that he liked reading. He tried to write books that he would have enjoyed reading when he was 12 or 13, a time when he remembers being too old for children's books but not old enough to read adult novels. The CHERUB series follows the life of a character named James Adams (formerly James Choke), a member of CHERUB, a top-secret branch of the British Secret Service. The organisation recruits orphan children and trains them as intelligence officers. Once qualified, they are used to investigate targets ranging from international terrorists to gang leaders. As children, they are considered innocent by their targets. CHERUB agents start basic traic training at aged 10. Basic training is a 100 day course that prepares CHERUB's for the dangers they may face during missions. CHERUB agents are then eligable for missions once passed basic training, CHERUB agents leave CHERUB when they're aged 18, or in some exceptional cases 19 or 20. So far Muchamore has written and published eleven CHERUB novels, with another one in production. In 2008 he also released Dark Sun as a World Book Day novella. The CHERUB series has been sold in more than 20 different countries and has won various awards. Most notably, The Recruit has won 8 literature awards.